"Once in a blue moon, a digital piano such as the Yamaha YPG625 or the YPG525 comes along..."
The on-board speakers are small and are okay but if you're recording stuff or want to get the most out of the YPG-625 it's recommended to use an external amp/speaker system. Once in a blue moon, a digital piano such as the Yamaha YPG625 and YPG525, come along that shocks everyone with its sounds, features, and price, and, wins Product of the Year and Keyboard of the Year from Music & Sound Retailer at NAMM. It's no surprise then that the Yamaha dealers are selling them about as fast as they are receiving them. At Yamaha Musician, we went to our local Yamaha dealer to check out what the entire buzz is about. The YPG625 is a fully weighted keyboard with Graded Hammer technology, while the YPG525 is a box type 88-key keyboard. They both have 500 voices, 150 accompaniment styles, 10 drum kits, and 2 SFX kits. They're capable of dual and split keyboards, have a 6-track song recorder, pitch bend wheel, 32-voices of polyphony, and can give you lessons and show you the score and lyrics for virtually any song that's in midi format and you can download from the internet to USB memory. The YPG625 weighs in at 18kg (39lbs. 11oz) while the YPG525 weighs 11kg (24lbs. 4oz). The included keyboard stand adds about an extra 6kg (13 lbs. 3oz) of weight. The two pianos also come with a music rest, FC5 footswitch, CD-ROM song disc, and power adapter. Pitch Wheel on a Digital Piano? Yes! That's right this is one of the few home digital pianos that we've seen Yamaha put out with a pitch bend wheel (exception: DGX620 and DGX520 which have been discontinued and replaced by the YPG625 and YPG525). Yamaha usually puts pitch wheels on their 88-key professional series keyboards (Motif XS8 and S90ES, for example) so this is a real plus. 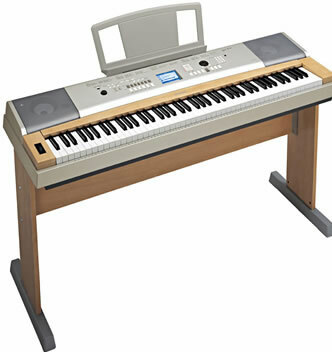 Obviously the Yamaha YPG625 and the Yamaha YPG525 are digital pianos and superb ones at that. However, we also really loved the strings, saxes, clarinets, and French horns too. These instruments sounded very much on par with Yamaha's Clavinova sounds except the YPG625 and YPG525 have a pitch wheel giving you even more expression thus taking your playing to a whole new level of realism. Actually, these digital pianos have a five-track recorder plus one track for accompaniment. Since you can see the score for the left and right hand parts of your compositions on the LCD screen, Yamaha designates track 1 to record your right-handed parts and track 2 for your left-handed parts, tracks 3-5 for any other melodies, and track 6 for accompaniment. You can also mute individual tracks, quantize, and re-record over existing tracks if you like. To see the musical score for your recordings, you'll have to convert the song to a midi SMF 0 (Standard Midi Format) and save it to your USB device. Yamaha does a good job explaining this procedure in the User Manual. It's a Piano Teacher too? Wow, we were really impressed with Yamaha's new music lesson feature on this digital piano. The Yamaha YPG625 and YPG525 come preloaded from the factory with 70 SMF 0 midi songs included on the CD-ROM. These songs include pieces by Beethoven, Mozart, Chopin, and Pachelbel. (Like we mentioned before, you can have a lesson with any song you want provided it's a SMF 0 file). There are three steps to learning a song on these digital pianos. Lesson 1: Learn the correct notes, Lesson 2: Play the correct notes with the correct timing, and Lesson 3: Play the correct notes with the correct timing along with the song. While you are learning your lessons, you have the choice of either learning the right-hand, left-hand, or both-hands and after you are done with a lesson, the Yamaha YPG625 and YPG525 will evaluate your performance with an OK, Good, Very Good, or Excellent response. We were very pleased with all the features and quality sounds Yamaha packed into these digital pianos. From the feel of the keyboard, the ample yet compact speaker system, to the large back-lit LCD screen and musical score feature, we can definitely understand why these digital pianos are two-time award winners and favorites among musicians. The only difference between the YPG625 and the YPG525 is the YPG625 has the graded hammer action, so, if you're serious about learning piano, we would recommend the YPG625 since you will quickly out grow the YPG525's light keyboard action. At a price of around $800 and $500, the Yamaha YPG625 and Yamaha YPG525 are a great value and are sure to put a smile on your face for a long time.